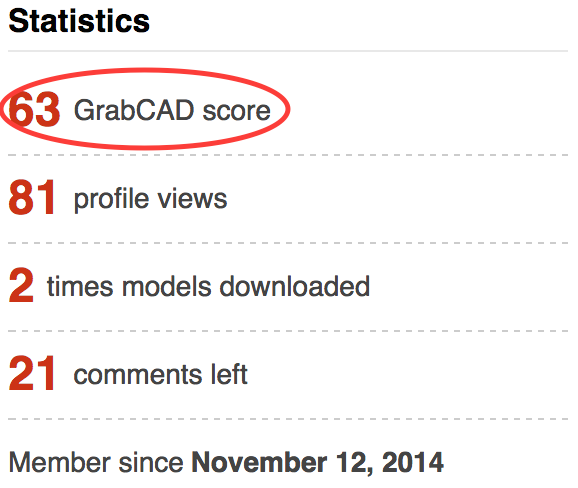 What is your GrabCAD score and how do we calculate it? Your first download of a model will give you +3 points. Your first like of someone’s model is another +5 points. Follow your first engineer to receive +10 points. Leave your first comment to a model, question, tutorial or anything to add another +15 points. Your first upload of a model gives a big jump of +40 points! Your first question you ask gives you +5 points. Your first answer on anyone’s question gives you another +10 points. Your first tutorial is a great way to give back to the community and gives you +20 points! Then, it gets more challenging. To continue adding to your GrabCAD Score, you need to add quality CAD models and answers to the Community as well as get positive feedback from your peers. You receive points when someone likes your model. You receive points when someone says, ‘It worked’ in Q&A and Tutorials. Ideas for other actions that should receive points? Send us your feedback. How do you earn badges on GrabCAD? 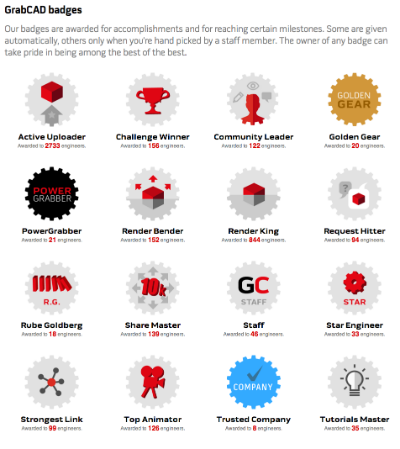 We have a variety of badges that you can earn as a GrabCAD Community member. View our full list on our Badges page. Click on a badge to learn how you can earn it. Another way to learn about badges is by clicking on them in member profiles. Still wondering the best way to get a badge of your own? Email problem-solvers@grabcad.com for help.